Reverend Dr. David Kirby, wife Margaret plus Damson the dog, arrived safely at the Presbytery in Floirac today and will be with us until February and what a busy time it will be! David was born and brought up in Yorkshire and went up to Durham University to study Geography. It was while he was at Durham that he and Margaret met – in an ambulance, and they were married four years later in 1966. David was ordained in 1987 and served for thirteen years as non-stipendiary priest at St Barnabas church, at the other side of Huddersfield in Crosland Moor. 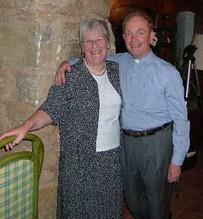 On retirement from the University Margaret and David moved to Praia da Luz in the Algarve, where David was Assistant Chaplain for almost five years. On leaving the Algarve they returned to Yorkshire, living in Bramhope where David is Honorary Assistant at the local parish church of St. Giles. David and Margaret have one son, Hugh, born in 1969 and two grandsons. Margaret and David love music of many genres and love travelling, and in their Golden Wedding year had a memorable holiday in Ethiopia. Romania and Armenia are on the agenda for 2017. David will be leading our All Age Worship Service this coming Sunday 13th November at 10:30 – Welcome to Bordeaux and Aquitaine!